These document(s) are designed for an assignment of an existing lease to a company acquiring all of the assets of the existing tenant. The provisions also indicate that the existing tenant guarantees the performance of the acquiring company, who becomes the new tenant. This Assignment and Guarantee Agreement (this "Agreement"), dated as of ______________, by and among Acquiring Entity, Inc.., a _________ corporation ("Acquiring Company"), Acceptable Tenant, Inc., a _______________ corporation ("Tenant"), and Commercial Property Landlord, LLC, a _______________ limited liability company ("Landlord"). 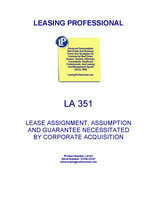 G. Tenant has previously provided Landlord with notice, pursuant to Section 36(a) of the Lease, of Tenant's intent to assign the Lease to Acquiring Company, and Tenant has agreed in connection with such assignment to guarantee Acquiring Company's obligations under the Lease pursuant to the terms of this Agreement. In consideration of such guarantee by Tenant and the assumption of the Lease by Acquiring Company, Landlord has agreed to consent to such assignment. Effective immediately upon closing of the Acquisition Transaction, Tenant hereby grants, sells, conveys, transfers, assigns, releases and delivers to Acquiring Company all of Tenant's rights and interests under the Lease, to have and hold the same unto itself, its successors and assigns, and Acquiring Company hereby accepts such grant, sale, conveyance, transfer, assignment, release and delivery. 2. Acceptance of Assignment and Assumption of Lease Obligations. Effective immediately upon closing of the Acquisition Transaction, Tenant hereby transfers, assigns and delegates to Acquiring Company all of Tenant's obligations under the Lease, and Acquiring Company hereby accepts such transfer, assignment and delegation and assumes and agrees for the benefit of Landlord to be bound by all of the terms, conditions and covenants of the Lease to be performed by Tenant, and agrees to faithfully pay, perform and discharge all of Tenant's obligations under the Lease when due.